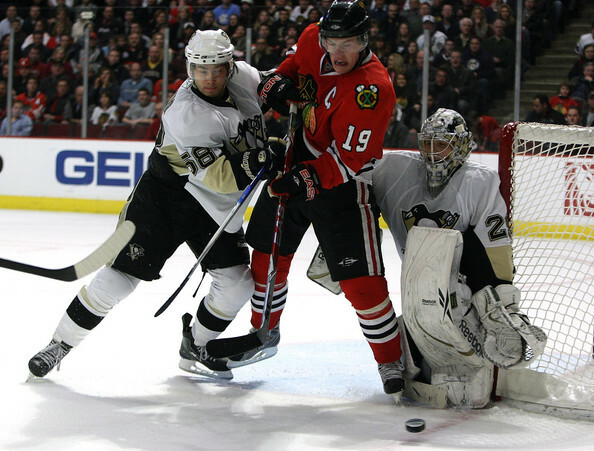 Kris Letang battles with Jonathan Toews in a recent battle between the Pittsburgh Penguins and the Chicago Blackhawks. These two teams will face off in one of the NHL’s most hyped match ups of the coming season. As the defending Stanley Cup Champion Chicago Blackhawks get set for the 2013-2014 season, fans have been waiting for months to see their heroes back on United Center ice. Today sits as one of the best days during this waiting period, with individual regular season tickets going on sale, which you can try to get a hold of on the Blackhawks’ web site. Below are my top five home games that Hawks fans should consider for this season, minus the October 1st home opener against Alex Ovechkin and the Washington Capitals, which is an obvious one and likely the first sellout the Hawks received. Beyond being able to see the Hawks receive their championship rings, there should be a fair amount of memorable moments to come this season. 4) October 19th vs. Toronto Maple Leafs — An original six match up and Toronto’s first trip to Chicago since 2012. Also, this will mark the return of ex-Hawk Dave Bolland, who scored the game winning goal in game 6 to eliminate the Boston Bruins for the Stanley Cup. 3) March 16th vs. Detroit Red Wings — I hate to write this but this date will be the only time that the Hawks’ deepest rival visits the United Center because of Detroit’s move to the Eastern Conference. This will also be the first time that the Red Wings step on the Hawks’ ice since Game 7 of last season’s classic playoff series. This game will have a playoff like feel to it and whenever the Hawks and Red Wings (and their fans) get together, sparks usually fly. 2) April 9th vs. Montreal Canadiens — Another Original 6 rival makes its return to the United Center for the first time since 2012 in the 2014 regular season home finale. These two teams have such rich and storied histories, along with countless hall of famers. You can also say these two teams have the most talented young stars in the NHL and this game very well could have major playoff implications in terms of positioning. 1) March 1st vs. Pittsburgh Penguins — As part of the NHL’s Outdoor Stadium Series — which will bring six NHL games to outdoor arenas this season along with the Heritage Classic and Winter Classic games — this promisingly action-packed affair will take place in Soldier Field in primetime on NBC. As most fans can remember, the last time the Hawks participated in an outdoor game was back on January 1, 2009 against Detroit in the Winter Classic at Wrigley Field. That game not only brought national attention back to the Hawks but to the sport of hockey in general. Superstars will dominate this match up with the likes of Sidney Crosby and Evgeni Malkin for the Penguins while Jonathan Toews and Patrick Kane continue to represent the Hawks. With such skilled players on both teams, this should be one of the best games in the NHL in 2014. BONUS GAME: January 19th vs. Boston Bruins — This will be Boston’s first visit to Chicago since Game 5 of the Stanley Cup Finals. If you can’t go, this will still be the showcase game on NBC that day, with the Bruins surely looking to prove something to the champs. ← On the WARRpath: Will Tiger Ever Roar Again?